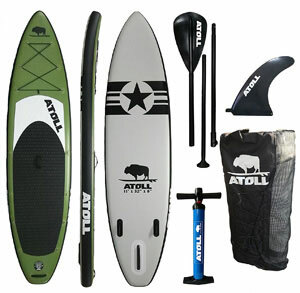 The Atoll 11’ Paddle Board is a product of Atoll Board Company, located in California. They boast of offering the best paddleboards in the market at a fair price. 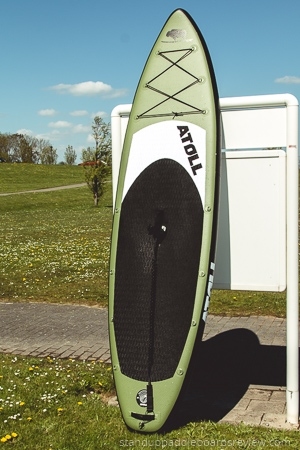 The Atoll inflatable is a premium paddleboard made with some of the best materials. These materials and the state of the art construction make it lighter than comparable models. It is meant to give you the ultimate user experience, right from the moment you take it out of the box. At 11’ long and 32” wide, this iSUP can serve as a Yoga SUP, touring SUP, among other SUP variations. 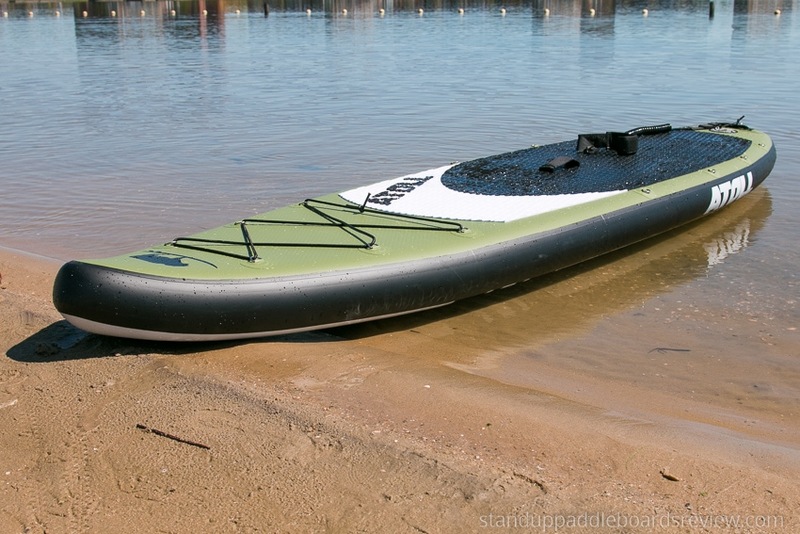 The Atoll is perhaps the best inflatable paddle board currently available and definitely my favorite SUP board. Before the team made the newer model of this board, they went out of their way to ask users what they would like. They took the answers into consideration and created the perfect solution for paddlers. The earlier model did not come with a leash so they added that in the box and increased the number of D-rings to 15 as per the customers’ wishes. They also enhanced the quality of the gear included in the package. Atoll Company claims that this board is perfect for any SUPer out there. According to them, it is ideal for everyone regardless of age or height. How true is this? You will find your answer in this Atoll paddle board review. Every detail is outlined and genuine feedback from customers to help you make a decision. The Atoll 11’ paddle board is made with a dual layer PVC and the new Fusion Light construction. Both on the top and bottom, it is wrapped with a second layer of patented PVC. The end result is a strong and rigid board. When fully inflated, you would easily mistake it for an epoxy board. The construction makes it 30% lighter than competing models. The package includes a bag, manual pump, leash, detachable fin, front and back bungee tiedowns, three-piece paddle and a repair kit. The manufacturer ensures that you have everything you need to start paddling the same day; talk of user friendliness. The accessories are of high quality—just like the board. The provided backpack has been enhanced in terms of quality. It is now lightweight, breathable and made of heavy-duty nylon. The bag is large enough to fit all the included accessories with extra space for any other essentials you might want to carry. It has mesh sides that let the inflatable board dry properly when stored. The black aluminum alloy paddle is lightweight at 2 lbs 2 ounces. It allows you to paddle for long without getting fatigued—which is important if you are going for a long SUP tour. The three-piece paddle is adjustable to give you the freedom to choose the perfect length for you. Your kids can also use it. The top is covered with a black and white EVA foam pad to prevent slipping and losing your balance when the board is wet. The EVA top is also soft and easy on your feet. The deck has 15 D-rings for you to tie down cargo and paddleboarding essentials. This way, when you are out SUPing your belongings will not fall and probably get lost in the water. The tri-fin design provides for efficient and easier tracking. 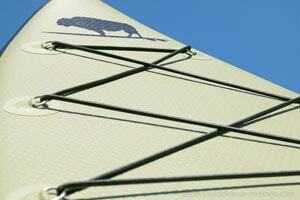 It makes the iSUP glide smoothly and faster in water and you can even use it for minor races. Some iSUPs are known to be bulky and slow in the water—but not the Atoll 11’. The Atoll inflatable board has a large deck. It is 11’ long, 32” wide and 6” thick. You can pretty much fit all your paddling gear on the board without much trouble. If you want you can also bring your kids or dog along. Besides the board being large enough to let you carry anything they may need, the soft EVA top will ensure they are comfortable. These dimensions are beginner friendly. Newbies will find it easy to learn balancing on this large board. This iSUP is highly durable. The PVC material is super tough and the board will stand any extreme conditions. It is not prone to dings and dents like a fiberglass board. Every paddler dreads getting their board dented as sometimes the damage can be irreversible. The Atoll helps SUPers enjoy this fantastic sport without worry. The Atoll 11’ is easy to transport. In addition to being an inflatable paddleboard that deflates, it is lighter than most iSUPs. It also has three carry handles to help you carry it to the water when inflated. The first is at the top of the D-rings, the second at the centre (in case you are carrying it alone), and the third is at the back of the deck. This quality inflatable paddleboard has a capacity of 300 lbs. it is suitable for bigger SUPers. If you are lighter you can have an extra person on board. This weight capacity comes in handy when going SUP fishing or a long SUP expedition where you need a lot of supplies. It has a two-year manufacturer’s warranty. When a manufacturer backs their product up like this, you know they put in a lot of expertise and quality material. The warranty covers any material or workmanship defect for a whole two years. With such a deal why would you not consider it? You will not have to buy paddling accessories. Everything you need is provided in the box; a bag, paddle, leash, pump, repair kit, tiedowns and a detachable fin. One thing you might have to buy, though, is an electric pump. The provided manual pump does the job properly but it will burn you out. When you put together the cost of these accessories you will realize that you save a significant amount when you buy this board. It is tough and rigid. When fully inflated (about 15 PSI), the Atoll inflatable board is just as stiff as a traditional hard board. It does not sink in the middle, interfering with your stability. It cuts through the water with so much agility you will hardly believe it is an inflatable SUP. The material used to make this iSUP is indestructible which makes it worth your money. The deck is large. This board is suitable for various SUP variations because of its features, one of them being a large deck. When going for SUP fishing or SUP touring you can fit a cooler box, rod holder, a bag and everything else. The multiple D-rings keep your stuff secured. SUP yoga requires a large surface for all the poses and balance. You do not have to buy several boards for all these variations when you have the Atoll. The Atoll 11’ has an anti-slip surface. When a surface gets wet, it becomes slippery. Imagine how this would play out if you are struggling with a big fish while SUP fishing or you are beginner struggling to attain and maintain balance. Not so with the Atoll. The EVA foam pad helps your feet to remain firmly planted in place. It is soft and gentle to your feet unlike a hard paddleboard. Moreover, it is great for kids and pets. It is lightweight and has a good capacity. The Fusion Light construction makes this board super light at 19 lbs. you never have to worry about carrying it. The 300 lbs weight capacity allows for heavier paddlers or more than one SUPer on board. The manual Bravo pump takes quite a bit of of effort. It has a lot of praises to its name but do yourself a favor and get a SUP electric pump. Inflating an iSUP is hard and it gets harder as you approach the recommended 15 PSI. If you stop to catch your breath occasionally you will make it. However, it will still frustrate you and the sooner you get an electric pump, the better. The Atoll is a little on the expensive side. There are nice iSUPs retailing at a much lower price. But, you get what you pay for—almost always. The Atoll is lighter, ultra tough and has all accessories included (which are as great as the paddleboard). I consider this board to be worth its price. Atoll is fairly new to the standup paddleboards industry but that has not stopped them from doing an amazing job. Customers say that the Atoll SUP comes well packed. Setting it up and inflating it is easy, although the pumping gets more difficult at 8-15 PSI. Inflation takes 5-7 minutes. The board is very stable on water; newbies find it useful in learning to balance. As a beginner, you will find yourself balancing well and paddling in the first few minutes—if you are keen to learn. It has great maneuverability and glides smoothly in the water. The deck space has also been mentioned several times. 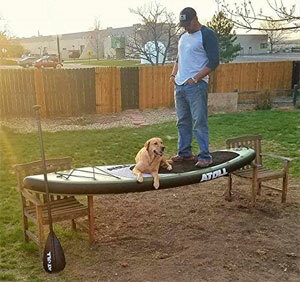 Users have all the room they need to play around with their dogs. The deck pad is thick and soft, just as advertised. The paddle has proven to be quality. It does not turn or move as you paddle. It is also light and forgiving to your arms. The bag fits all paddling accessories provided. It has shoulder straps and a waist buckle for comfort. This Atoll board is family friendly and there is no reason why the entire family cannot have a great time SUPing together. There are no negative reviews on this iSUP. With all the fantastic features and amazing reviews, it is hard to give a negative feedback. 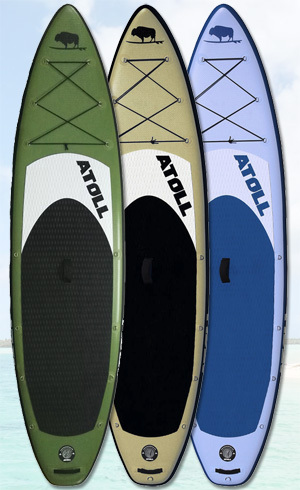 The Atoll 11’ inflatable paddleboard is a great looking, high quality paddle board. With its all-around shape you get the best of everything. This board is sturdy, tough, stable and it tracks well (it is easy to maintain a course). Atoll Board Company is not yet a household name but that does not really matter when their products are this good. Expect it to give you great service for a long time. Although it is a little pricy, there are pricier ones that do not even offer half its qualities. Moreover, all paddling gear is provided, saving you a few bucks. 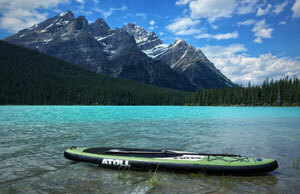 The Atoll is perhaps the best inflatable paddle board currently available and definitely my favorite SUP board. Of course this is a highly subjective option and dependent on my style of paddle boarding. When I go out it is usually to cruise on a lake or canal, and I’m looking for a board that is stable, relatively fast and with good tracking capabilities. And on these points, the Atoll delivers. Another plus of the Atoll SUP is its low weight. It only weighs 19 lbs. and is one of the lightest inflatable paddle boards around. This makes for easy carrying to and from the water – even my kids have no problem carrying the board between them. The 300 lbs. capacity will allow you to bring your fur friend, kid or extra paddler on board. This inflatable is awesome and there is no reason for you not to buy it. Get yourself an Atoll 11’ and be the one to write the next positive review.